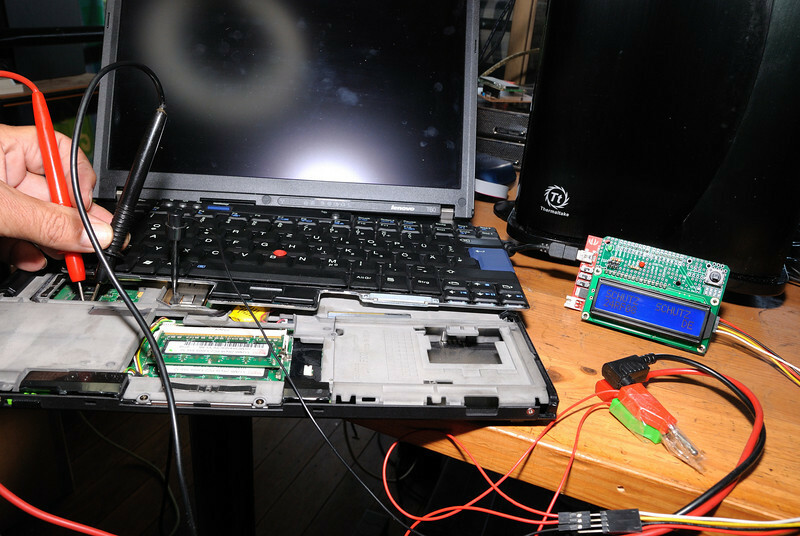 The USB Based, ThinkPad Supervisor Password Recovery or Clear, can be used unlimited times on unlimited ThinkPads! 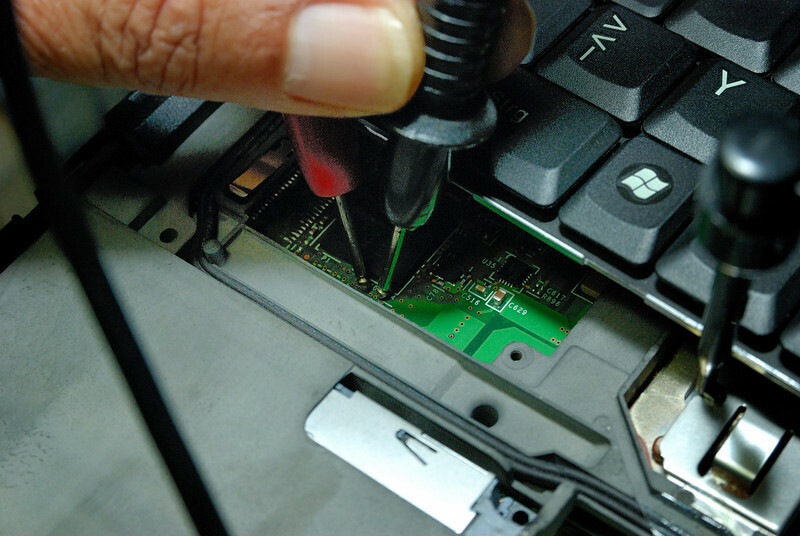 Joe in Australia offers the only Fully Assembled, Programmed and Tested unlimited use ThinkPad Supervisor Password Recovery or Clear and CRC Repair Tools in the world. KM9AUSB has identical functionality using a different board. Using Joe's KM9USB to Zap/Remove SVP in "Stand Alone Mode". Stand Alone mode simply means that you do not need any other PC or Laptop - just the KM9USB board with its ZAP SVP button and power from the USB port of the password locked TP. You connect 3 wires from KM9USBPRO to 3 connection points inside your locked TP. You, when ready, switch ON the locked TP. Your ThinkPad's Supervisor (SVP) is gone as if it never existed!!!!! KM9USBPRO, in "Stand Alone Mode" - will easily Zap/Remove SVP an unlimited number of times, from all the TP Models listed below, that is all models that have either a 24RF08 or LSI EEPROM, at the push of a button even if encrypted TPM/TCPA is enabled without needing a second PC or Laptop. ThinkPads that will work with the KM9USBPRO in "Stand Alone Mode"
KM9USBPRO, when connected to a second PC or Laptop will easily Display SVP from LSI and 24RF08 models listed above if not TPM/TCPA encrypted, it displays SVP from 24C01, 24C03, 93C46 models listed below, it Clears SVP passwords on LSI and 24RF08 models listed above even if encrypted TPM/TCPA is enabled. Joe's KeyMaker 9 USB PRO is for the professional repair company. it allows full access to the security chip so they can manipulate the data as they deem necessary. With this version, you can really get to the heart of the security chip but you can also really screw things up, so this is really for the service professional who has a deep understanding of the functions of the security chip. How do I buy it? - go to the Buy Products page . To Zap the SVP with KM9USBPRO, in "Stand Alone Mode" you need a mini-USB cable to power the KM9USBPRO from the USB port of the locked TP. You connect 3 wires [from the 4 wire connector supplied] to the EEPROM connection points on the locked TP. KM9USBPRO Top of the KeyMaker 9 USB range - has all possible features to tackle difficult password recovery operations for example when the TP is reporting lots of errors or when you suspect that the TP you purchased at Auction was heavily corrupted by someone before you who had no clue and followed all the incorrect ThinkPad Password recovery ideas to be found on the net. 3 wires are connected INSIDE the locked TP to its EEPROM and NOT to a USB port. Only the KeyMaker 9 USB PRO itself is connected to the USB Port on the locked TP. In this basic form the USB cable is only used to supply power to the KM9USBPRO board. The USB connection is also used to interact with the firmware (program) inside the ATMega1280 Microcontroller on the KM9USB board and also to display progress and results on your PC or laptop Screen. KM9USBPRO arrives fully assembled, tested and ready to use - You know it will work when you switch it on. 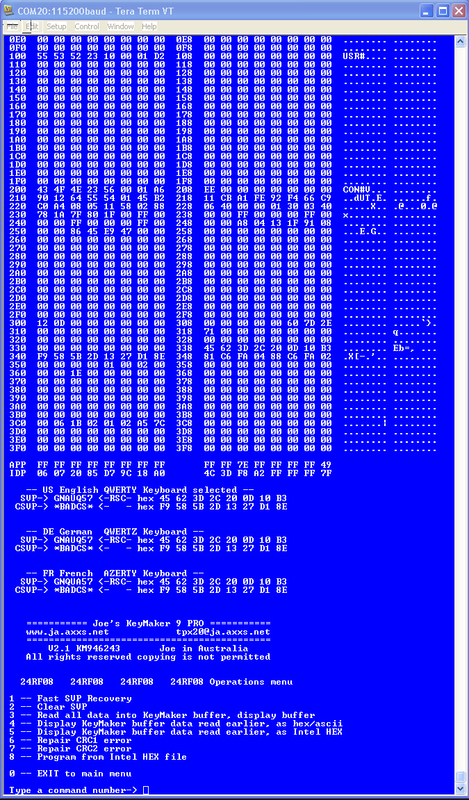 Below are photos of a T60 being unlocked, using Joe's KeyMaker 7. Using two multi meter leads with sharp points hand held [in one hand] for the SDA and SCL connections. A black clip is being used for the GND connection attached to the CPU heat sink. I would recommend that you set a new Supervisor Password, one you can remember. If you don't set one someone else can and you may have to do this all over again, much easier to set your own password so no one else can set one and frustrate you. When using KM9USBPRO connection leads to the EEPROM inside a TP can be connected whilst the TP is switched OFF or ON, the leads can be left connected while the TP is being switched ON and OFF. Another plus for Joe's KeyMaker 9 USB PRO. Seeduino Mega ATmega1280 board fully assembled, tested and programmed with Joe's KeyMaker 9 USB Firmware. Short length of thin diameter enamelled copper wire to be used for connecting to EEPROMs. Used IF you prefer to solder connections to the EEPROM. Clips [not supplied] can be used if you wish to do no soldering at all to the EEPROM. 6 x female headers, not used for TP unlocking, they can be used to populate the board if you wish to make use of the board's Arduino functionality. Documentation, right here on this web site KM9 User's Guide, which includes detailed illustrated instructions on how to connect it to ALL the applicable TP models. Joe's KeyMaker 9 USB with supplied 4 way cable plugged in over the I2c connector, this cable will do 99% of all TP models. Just remember: you ALWAYS see it here first. Joe's KeyMaker 9 USB PRO with its unique ZAP SVP feature is yet another first. Joe's KeyMaker 9 USB PRO arrives in your hands FULLY assembled, programmed and tested, you KNOW it is going to work and can concentrate on starting to unlock your TP. No need to waste time and money sourcing parts that, depending on where you buy them, can easily cost a lot MORE than the assembled and tested Joe's KeyMaker 9 USB PRO. Ready to go - it does not get easier than that. 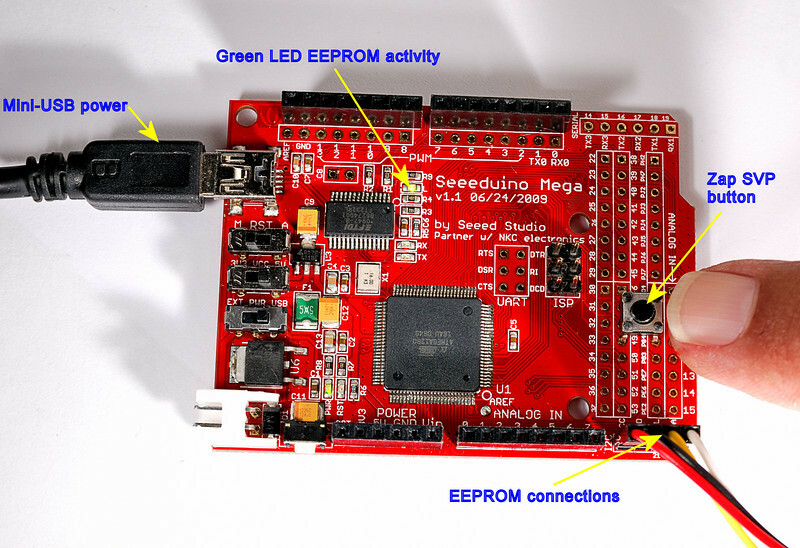 The entire Program runs inside the onboard ATmega1280 Microcontroller. To interact with you, it only requires that you install the appropriate USB driver for your system and any one of the numerous freely available "Terminal Software programs" on your PC, MAC or Linux System. You will be hard pressed to find anything that even comes close to Joe's KeyMaker 9 USB PRO in one quality state of the art feature rich convenient USB powered TP unlocking tool that does it ALL. Close-up view of Joe's KeyMaker 9 USB PRO, how is it connected. The reason, is Joe's KeyMaker 9 USB PRO is a powerful state of the art Microcontroller based board with an USB interface, ALL THE WORK is done ON the board by the Microcontroller and my firmware program, you ONLY need a Personal Computer of some kind to interact with the program running on the board and display the results whilst performing Initial Activation or if you wish to perform more advanced operation which require a 2nd PC.